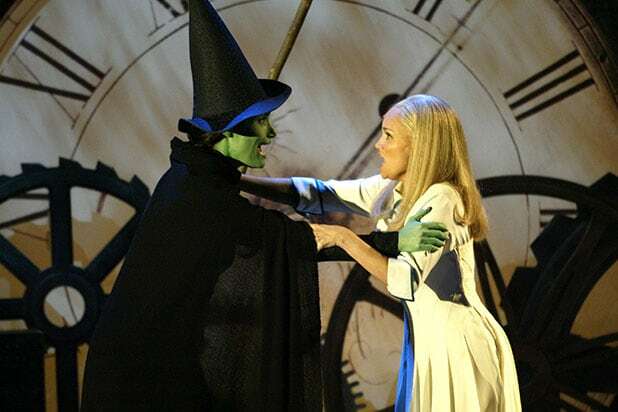 “Wicked,” the hit Broadway musical about the making of Oz’s wicked witch of the West, quietly passed “The Phantom of the Opera” this spring to become the second-biggest grosser of all time on the Great White Way. According to figures from the Broadway League, “Wicked” has earned $1.12 billion from its first performance in 2003 through July 9 — just ahead of the $1.11 billion reaped by Andrew Lloyd Webber’s classic 1988 rock opera over its three-decade run. And “Wicked” did it in half the time. The show, produced by David Stone and Marc Platt, is also inching up on Broadway’s all-time box office champ, Disney’s stage adaptation of its animated big-screen hit “The Lion King.” Director Julie Taymor’s innovative production has earned more than $1.38 billion since it first opened in 1997. None of these figures account for overseas and touring productions, of which there have been many over the years. The musical prequel to “The Wizard of Oz” has amassed worldwide revenues of more than $4 billion in all of its incarnations — and that’s before a long-awaited movie adaptation from Universal Pictures. “That’s the gross number, but yes, in terms of its profits and the margin, it’s extremely significant in the history of Universal, which is its largest investor,” Platt told TheWrap in a 2015 interview with TheWrap. Universal and Platt acquired the rights to Gregory Maguire’s 1995 novel “Wicked: The Life and Times of the Wicked Witch of the West” in 2001 with plans to develop a non-musical film. But they were soon approached by “Godspell” and “Pippin” composer-lyricist Stephen Schwartz about doing a stage musical version that has proven to be enormously popular. Who would play Elphaba, Glinda, Fiyero and co. in the movie version of "Wicked"? TheWrap picks some big stars for the big-screen adaptation. Kendrick has proven her singing skills in the "Pitch Perfect" movies and "Into the Woods," and was nominated for a Tony Award for her performance in "High Society." Seyfried not only looks like Glinda the Good Witch with her golden locks, but also has the perfect vocal range to match Kristin Chenoweth's. Seyfriend already has musical credits to her name, including "Mamma Mia!" and "Les Misérables." "Glee," "Frozen" and "Hamilton" -- Jonathan Groff has done it all. And because the Broadway musical "Hamilton" is so hot right now, Groff would surely be on the radar for "Wicked's" casting. Tell us Meryl Streep doesn't come to mind when you think of Madame Morrible. Streep has played these roles before, and previously sang in movies like "Into the Woods" and "Mamma Mia!" Plus, Meryl Morrible has a nice ring to it. McKellen just screams wise man, and that's exactly what Doctor Dillamond, aka the Goat and a professor at the university, is in "Wicked." Can't you just imagine Victor Garber in the suit, saying "Hey, look who's wonderful, this corn-fed hick, who said it might be keen to build a town of all green and a wonderful road of yellow brick" to Elphaba? Nessarose is the beautiful and delicate younger sister of Elphaba. Rossum also played a witch of her own in "Beautiful Creatures," and would get the innocence and beauty of Nessarose just right. Daniel Radcliffe is young enough to play Boq, Nessarose's love interest and the munchkin who becomes Tin Woodman.